The shock absorber assembly DOES NOT have to be removed from the vehicle to perform the following inspection procedure. A light film of oil on the top portion of the lower shock absorber tube is normal. DO NOT replace the shock absorber for this condition. Oil or fluid residue only on the bottom or top of the shock absorber and not originating from the shaft seal, is not a shock absorber related problem. DO NOT replace the shock absorber, look for other external leaks. Light film/residue on approximately 1/3 (a) or less of the lower shock tube (A) and originating from the shaft seal, is a NORMAL condition. DO NOT replace the shock absorber. Oil drip or trail down the lower shock tube and originating from the shaft seal, is an ABNORMAL condition. Replace the shock absorber. 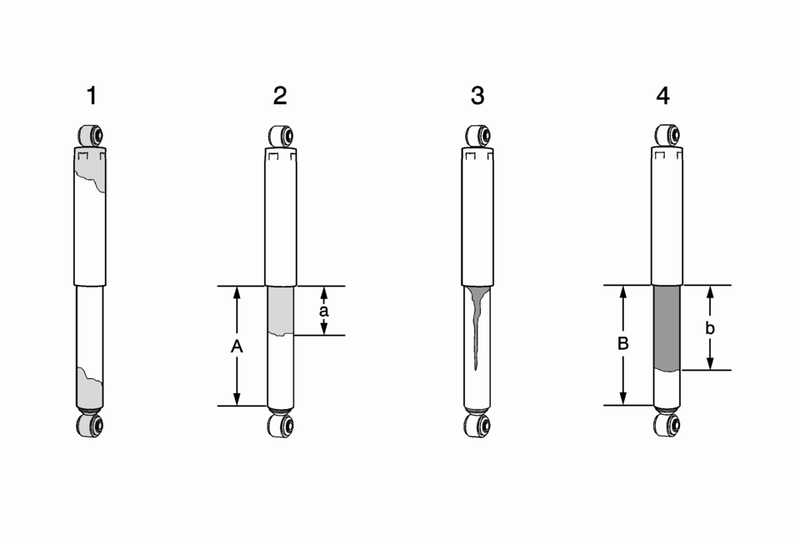 An extreme wet film of oil covering more than 1/3 (b) of the lower shock tube and originating from the shaft seal (B), is an ABNORMAL condition. Replace the shock absorber. Refer to Shock Absorber Replacement. Verify the customer's concern is present. If the concern is present, continue to the next step. If the concern is not present, then the vehicle is operating normally. Visually inspect each of the shock absorbers for external fluid leaks. Refer to the following conditions 1, 2 , 3 , and 4 for visual inspection. If conditions 1 or 2 are found, continue to step 4. If conditions 3 or 4 are found, replace shock absorber. Refer to Shock Absorber Replacement. If equipped with electronic suspension control system, ensure that the system is working properly. Refer to Diagnostic Starting Point – Electronic Suspension Control. Use your hands in order to lift up and push down on each corner of the vehicle 3 times. Remove your hands from the vehicle. If the corner motion exceeds 2 cycles, replace the shock absorber. If the shock absorber does not exceed 2 cycles, NO repair is necessary.